← ¿De donde vienen las instituciones prosociales? 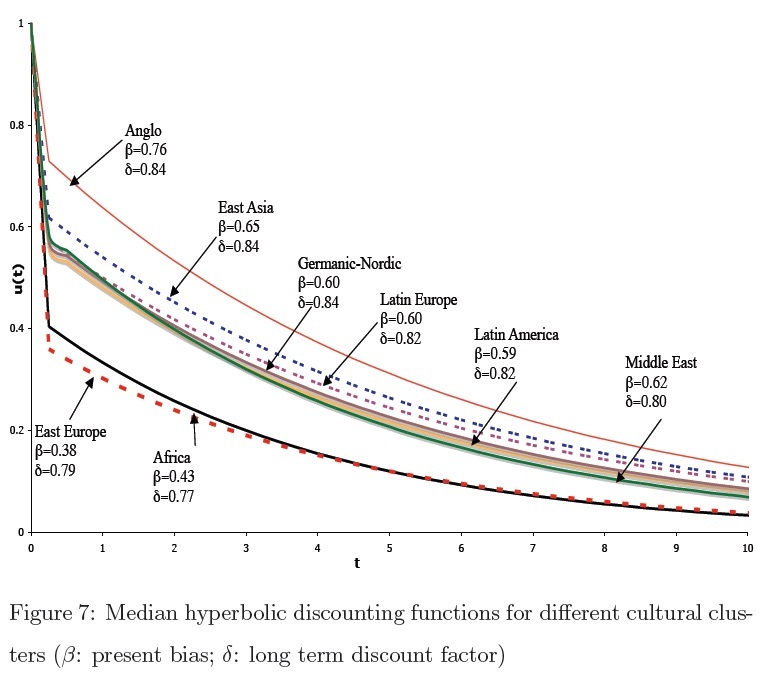 Cultural-evolutionists and evolutionary psychologists (a separate academic tribe) tend to bicker over whether culture is responsible for causing the massive anthropological diversity of behaviours seen around the world. EP (generally) argues phenomena such as food taboos are ‘evoked’ by a universal innate psychology in reaction to different physical environments. By contrast CE (generally) argues behaviours vary primarily because the information that’s stored inside people’s minds varies from society to society. Our genetically evolved capacity for social learning enables us to transmit information accumulated over the generations, and this shadow of the past can override influences of the current physical environment. Without this persistent element with its own evolutionary logic, which CE calls ‘culture’, it would be inexplicable why distinct groups living in identical or quite similar environments nonetheless still behave very differently. But you can get more general — ultimately, political order and market exchange are forms of large-scale cooperation amongst far-flung strangers. How did this ever happen? I think this is a good summary of the CE view on ‘ultra-sociality’ overall: humans have an instinct for cooperation, but the social norms of fairness evolve gradually to accomodate a wider definition of ‘insiders’ as a society gets larger and more complex. But a related puzzle gets lost in the shuffle: why does ‘ultra-sociality’ vary so much across the world ? Why are pro-social institutions not more widespread ? The poorest countries like Afghanistan have pretty low levels of “social capability” in governance, to put it mildly. Why does the South of Italy have so little “civic capital” compared with the North of Italy ? Why aren’t most countries like Denmark ? A possible solution is “strong reciprocity“, sometimes also known as “altruistic punishment“. Behavioural economists claim to have documented the existence of this emotional instinct to engage in costly punishment of non-cooperators. In anonymous experiments intended to mimic collective action situations, strong reciprocators tend to punish free-riders, even when they are not the direct victims, and even when there is no clear or assured benefit in the future from doing so. “Strong reciprocity” could be the psychological basis of the outrage that one sees in reaction to a social norm violation like, say, queue-jumping. Once again Avner Greif: in a series of papers on the nature of market exchange in individualist versus collectivist societies, he argues (amongst many other things) that informal institutions can be more efficient than formal ones under certain conditions. One might argue, the real institutional difference between developed and developing countries is actually a “social capital” gap: there are just many more coordination failures in developing countries. Never mind countries torn by civil war. Never mind countries where the kleptocrat with a monopoly of violence does not even bother to hide his plundering. Even the political systems of minimally functioning democratic societies are still organised de facto according to segmentary lineages, with clan- and tribe-based political parties campaigning to distribute to their members the spoils of the public treasury. In societies without clans and tribes, the distributive conflict in politics is played out along ethnolinguistic or caste divisions. But even in some relatively homogeneous societies, political parties are often a system of N-party competitive distribution of public spoils, with only nominal ideological differences between the parties. Greece is an upper-middle-income country and it’s still like that. But how do you improve a society’s collective action capacity ? How do people become more public-spirited ? How do people achieve the transition from group-specific “limited morality” to “generalised morality” ? This is effectively the same as asking how does the radius of trust widen beyond small kin or clan groups in the first place. You get parochial altruism or ethnocentrism when an expanding in-group progressively absorbs outsiders and reclassifies them as insiders. In recorded history, the most important way in-group favouritism has been applied to larger populations is through symbolic markers of common identity such as language or religion or extreme rituals. These create the glue for large associations of fictive kinship, “honourary friendship”, and imagined communities. War and violence feature prominently in the CE literature since that has characterised so much of human history. Thus the mathematical ecologist Peter Turchin, asking “how are empires [even] possible” in the first place, models group solidarity as an endogenous variable in the rise and fall of empires between 1500 BCE and 1500 CE. The prominence of war in the cultural-evolutionist explanations of the most ancient human institutions such as hierarchy, the state, and ethnocentrism has a clear parallel with the literature in economic history on “state capacity” in which the rise of effective states in the early modern period is also linked to war (Brewer, Tilly, Hoffman, Dincecco 2015, etc.) 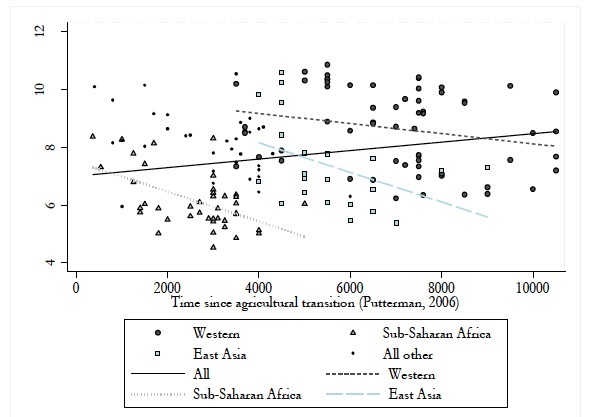 It also has an obvious link with the literature in comparative historical development inspired by Jared Diamond stressing the importance of “an early start” in agriculture and state history (Bockstette et al., Borcan et al., Spolaore & Wacziarg). So at this point, cultural-evolutionists often say “history matters” and reference the empirical work in mainstream neoclassical economics and other social sciences which demonstrates that “institutional shocks” in the past can leave a persistent imprint on contemporary culture. (If I’m going to get referred back to econ why did I bother to read you people again ???) This evidence sorts well with the cultural-evolutionist assumption that cultural inertia can persist for a long time. That econ literature finds real effects, by which I mean it does establish that culture matters, social norms or cultural values do change, and this has consequences for political and economic development on the margins. But the overall effects found by this literature seem to me kind of small, or highly local, or particular to their datasets. Or in some cases it cannot rule out reverse causality, e.g., it could be economic development which results in big cultural changes, such as rising levels of trust. I myself have little doubt that the experience of communism, for example, changed West and East Germans’ values regarding income redistribution and social weflare. Nor do I doubt different (cultural) preferences for leisure and work contribute non-trivially to the US-European differences in work hours. Whether your ancestors used the plough or the hoe, may still influence your views on gender norms. And it makes perfect sense to me that the strength of family ties explains political attitudes which influence the demand for labour market regulations in northern versus southern Europe. So different institutional paths chosen thanks to differences in culture and history do matter. There are always clever ways of magnifying the impact of culture by modelling culture-institutions-geography traps. Thanks in part to ancient biogeographic conditions, a particular cultural group is able to set up institutions reflecting their prevailing norms in a newly settled country; the ‘bad’ institutions persist and persist and persist, because this group controls the resources and has no incentive to make a “credible commitment” to “inclusive institutions” or an “open access order”; and because the ‘bad’ institutions persist, pro-market norms fail to emerge and the ‘bad’ norms reinforce the ‘bad’ institutions. There are like 3 or 4 tangled traps in there. So is ‘good’ governance just a matter of time, a long time, but still a matter of time ? Jerry Hough and Robin Grier have argued just that in a recent book which actually inspired this post. That book also makes a cultural evolution argument in which state capacity, markets, and “rational-legal values” co-evolve. Or is ‘bad’ governance an issue of timing mismatch, when democracy arrives before a strong state, as Fukuyama has repeatedly argued ? Interestingly, both Fukuyama and Hough & Grier point to the corruption-ridden United States of the 19th century as an important piece of evidence. The Proto et al. 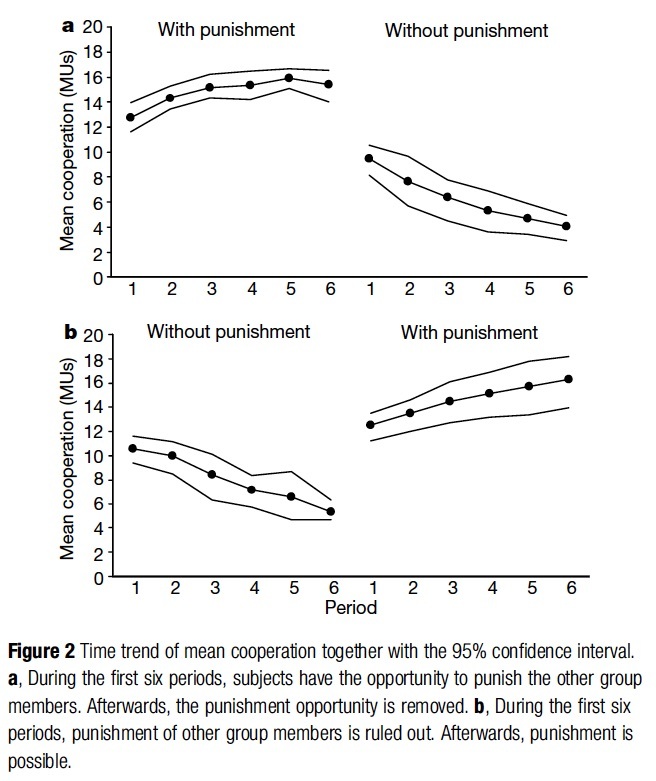 study replicates and extends a few earlier studies on intelligence and cooperation (Al-Ubaydli et al. 2014; Jones 2008). Moreover, it’s consistent with cross-cultural findings from Public Goods Games as described below. Patience also matters to whether cooperation is sustained. 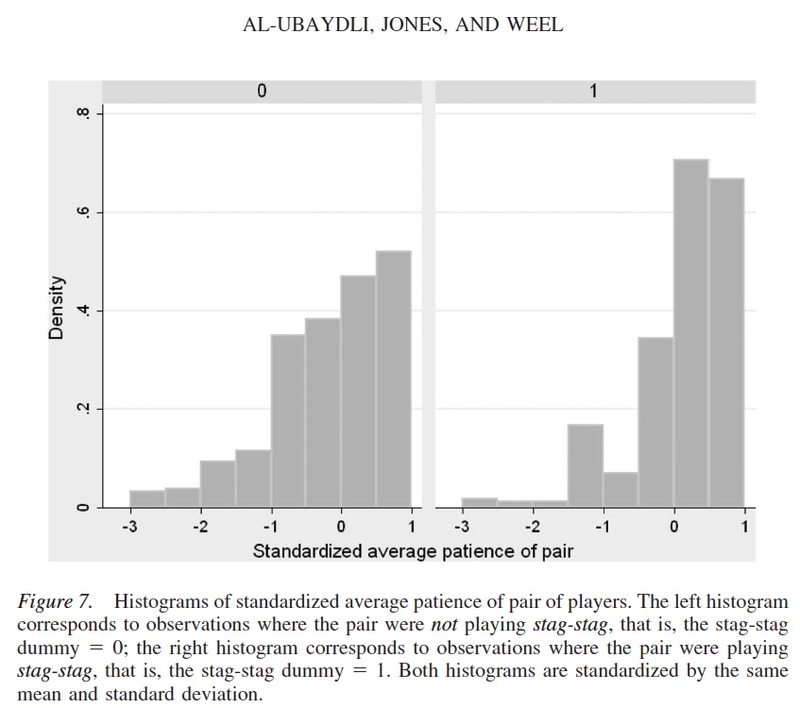 Low time preference is correlated with intelligence [Shamosh & Gray], but the association is not so big that you can’t have many smart people who are more impatient than some less intelligent people. So patience is a quasi-separate factor in cooperation. Need I say, that populations vary substantially in patience ? Wang et al. (2011) asked subjects in 45 countries about how much they value offers of money now, in the near future, the medium future, and in the far future. 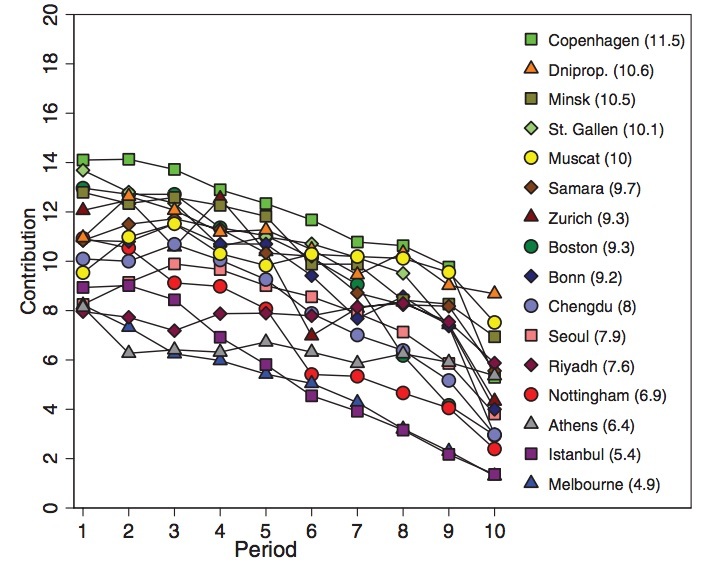 Based on their answers the authors computed discount rates for each group. But that depends ! If the stationary bandit is impulsive and impatient, he can remain a predator for a very long time. It’s not that people’s norms and values don’t or can’t change. They do. But that does not seem enough. Solving the most complex coordination failures and collective action problems requires a lot more than just ‘good’ culture. What is the above describing, other than the increasing ability of people to empathise with a wider group of people than friends and family ? Intelligence and patience allow you to understand, and weigh, the intuitive risks and the counterintuitive benefits from collaborating with perfect strangers. With less intelligence and less patience you stick to what you know — intuit the benefits from relationships cultivated over a long time through blood ties or other intimate affiliations. PS: It’s not out yet so I don’t know what’s in it exactly, but based on his papers that I’ve read, I strongly recommend Jones’s forthcoming book, The Hive Mind. And according to the table of contents now available at Google Books, it will cover the aforementioned “Political Coase Theorem” territory. Edit-Note: The Proto et al. and the al-Ubaydli et al. studies were, indeed, conducted with university students in WEIRD countries (the UK and the USA, respectively). The Wang et al. was with economics students in 45 countries. The Herrmann et al. was in 16 different cities including western and non-western countires. These are not intended as definitive evidences of anything. Yet they all strongly suggest intelligence and patience generate cooperative behaviour. Future studies like these — especially with regard to intelligence — will certainly be carried out in more diverse societies. Besides, Henrich et al. have already conducted one-shot ‘trust’ or ‘sharing’ game experiments in dozens of small-scale societies around the world. This entry was posted in Cultural Evolution, Institutions, Political Economy, Social & Civic Capital, Social Evolution and tagged Boyd & Richerson, collective action problem, cooperation, cultural evolution, cultural group selection, Joseph Henrich, market norms, Peter Turchin, social evolution, ultra-sociality. Bookmark the permalink. 45 Responses to Where do pro-social institutions come from? Now suppose that, as we have hypothesized, cultural evolution leads to a social environment in which noncooperators are subject to punishment by others. In many circumstances the reward for noncooperation can be enjoyed right away, while the cost of punishment will be suffered later; and thus people who overvalue immediate payoffs may fail to cooperate, even though it is in their own interest to do so. If generally cooperative operative behavior is favored in most social environments, selection may favor genetically transmitted social instincts that predispose people to cooperate and identify within larger social groupings. For example, selection might favor feelings such as guilt that make defection intrinsically costly, because this would bring the costs of defection into the present, where they would be properly compared with the cost of cooperation. -Also, surprisingly, to an even greater extent, Melbourne. What makes the Melbourne pattern so East Asian-like? Big populations of East Asian, perhaps? You’re right, thoughts, it looks like the city does have a large Chinese and Vietnamese population. Is there any data on the demographics of the actual sample examined for the study? The supporting data (http://www.sciencemag.org /cgi/content/full/319/5868/ 1362/DC1) but I couldn’t find anything to clear things up. So what is the story with Melbourne? When punishment is allowed it starts at a lower level than Chengdu, and when punishment is gone it sinks to the very bottom! Melbourne was a free city during transportation and today it is one of the largest destinations of immigrants and has been for decades. Perhaps its the Greek/Italian/Asian/Indian population? Perhaps it for Putnamite reasons that Melbourne looks the way it does, it may be the most diverse of the cities. 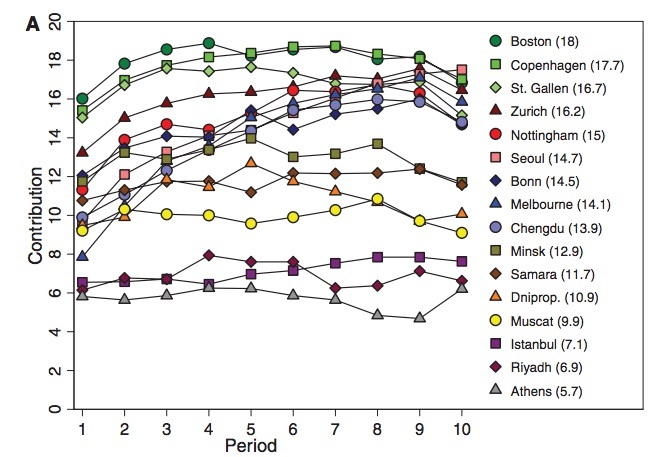 Afterall it does worse than Athens while being the largest Greek speaking city outside of Greece. As for patience, http://www.sciencemag.org/content/338/6107/682.abstract simply being poor tends to make people impatient. So bad institutions, poverty, and impatience become a self-reinforcing cycle. Thanks for making the final link clear. So now that I’ve had time to digest and think about this for a bit, I have a few questions. Why do some human communities cooperate better than others? Why do some human communities lose their ability to cooperate? One reference I will throw out here is Ramsay MacMullen’s Corruption and the Decline of Rome. The evidence that MacMullen provides paints a pretty clear picture of Roman institutional decline–for about three centuries preceding the Western empire’s collapse, Roman leaders became less and less “pro-social.” This happened in the East too, as MacMullen sees it, though they were able to pull themselves together in the 800s, where North Africa and the West seemed to have permanently lost whatever it was that made (pro) social capital possible in Rome. It is difficult to imagine the Angkor kings saying such things, just as it is hard to find a more blatant anti-social statement anywhere else. So what happened? The Cambodians were defeated in battle, yes. They forgot their technology and lost access to regional markets, yes. But do either of these account for the stunning loss of pro-social feeling? What can account for this? Do dynamics of pro-social institutional collapse follow the same patterns as pro-social institutional creation? Ibn Khaldun laid out a cyclical vision of rising and falling pro-social feeling. Peter Turchin presents a formalized version, and in many cases it explains events well. This makes sense within the context of your conclusions. If patience and intelligence are critical elements in all of this, then once the chaos of civil war is over and the pressures of elite over-production are done, the populace whose leading classes possess these psychological traits will be able to restore pro-social order once again. But how do we explain cases like Rome or Angkor, where once pro-social institutions were lost they never came back? Your question — at least insofar as pre-modern societies are concerned — is thoroughly explored by Peter Turchin in War and Peace and War, whose chapter 5 covers cooperative instincts. The book discusses the Roman empire extensively. Turchin also opens the book with the loss of cohesion in the Mongol empire, and the triumph of Russian asabiyyah. His forthcoming book extends his ‘structural-demographic’ model to the United States since 1800, although I’m a little sceptical about it based on what he wrote at his blog and in his Aeon article. Thanks for the links. I’ve read all of these but the books War and Peace and War, which I have only glanced through, and Historical Dynamics, which I have not opened. (Hurray for free material!) I will have to move them up my list. and an entire research program could be built around [your answers]. Well, do note, as I cite in the post itself, the idea that intelligence and patience matter to cooperation is one of the many themes covered in Garett Jones’s forthcoming book The Hive Mind. I haven’t read it since it’s not out yet but I’ve read his papers which have influenced my thinking. What I’ve tried to do in this blog post is give an overview of the very large literature on cooperation in numerous separate disclipines in a way which matters to my interests in economic history & development — an idiosyncratic literature survey, if you will. Seeing the long term results of Group A, the high Ravens of Group B would employ various means to get their low Ravens to cooperate. However, if we desegregate and allow for migration between groups, the high Ravens of Group B would choose the path of least resistance and migrate to Group A, leaving the low Ravens of Group B to fend for themselves. I think this approach has some interesting ideas I don’t neccessarily outright disagree with, but is there a reason you/this approach is totally ignoring the main field that usually studies this sort of thing – sociology? I mean I get that sociology is far from perfect, but cultural evolution has been around in it since Herbert Spencer, and there’s lots of papers on this topic. Isn’t it important to have some awareness of what has come before? The post is not about culture, per se. The post is about the global variation in cooperative behaviour. I have to wade through the “cultural evolution” literature first, because it is the cultural-evolutionists who have written the most about the origins of cooperation, and they explain it as a cultural phenomenon. The second half of my post essentially rejects the relevance of cultural evolution in explaining the global variation in cooperative behaviour. Please tell me which sociologists would be relevant to mention in this respect. Putnam is a political scientist whom I do mention. You reject CE, but “intelligence” and “patience” are learned characteristics, not innate ones (the capacity for them is innate but, given human genetic similarity but large group differences in these measures, the expression is clearly social). So they are themselves cultural. Most contributing factors seem also to be products: a more equal society will devote more time and effort to child-care and feed poor people better (so raising intelligence). It will also be a society where the risks of waiting are lower, so foster a more patient outlook. In short, there’s no single or foundational factor. And then there’s environment (the Khmer and maybe Rome cases, classic Maya…) and much else. btw, anthropology suggests that even small hunter-gatherer bands were united less by actual kinship and more by fictive kinship, with band-swapping relatively common. So the human disposition to ultra-sociality probably goes back a long way. But I rejected a very specific element of cultural evolution as the driver of institutional differences between populations — social norms — which were defined fairly precisely in the text above. And I did not say anything about the origins of the between-population differences in patience or intelligence. Further thought: there is a problem of neglect of scale and environment in this kind of abstraction. Larger social structures both enable access to larger resource flows and depend on those flows (eg the Khmer Kingdom could regulate water across a large area, which enabled high rice yields, which fed the Khmer court/temple complex). These higher-level organisations can collapse for any of a number of reasons (environmental degradation, climate change, outside pressure, internal imbalances…). They do not then necessarily revert to very small scale societies. Rather they fall back to whatever level of organisation can be supported (smaller kingdom, tribe plus trading net, town or village leagues…). So, in your terms, what needs to be explained – the ability of people to form large units – has to account not just for small bands and large states, but all the intermediate forms. From the individual or small unit perspective, bigger is not always better. The foraging family is usually better fed and housed, and more free personally, than the peasant. The superiority of the peasant society over the foraging one comes into play at the level of the group, not the individual. And this tension can manifest at all the intermediate scales – village/tribe/province etc. The connections between each stage of the pyramid have to balance resource flows, resource generation, the mesh between different identities (familial/local/regional/national) and find or adapt institutional forms that make the most of all of these. A lot of failures can be traced to institutional overload – trying for a level of complexity beyond what resources or identities will support. No, I’m afraid that’s a problem for the cultural evolution people, not me. This post is about how people achieve ‘good governance’ in modern societies/economies at national scales.